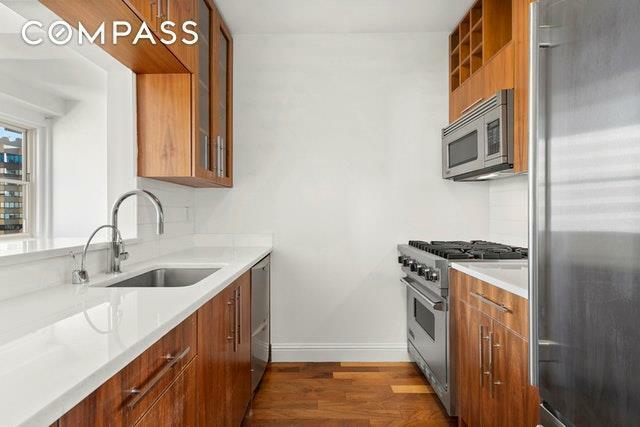 Sunbathed Luxury 31ST FLOOR CONDO with city and RIVER VIEWS - This beautiful 1 bedroom home elevates you into the sky high above the concrete jungle of the Financial District, considered one of the fastest evolving neighborhoods in New York City. This light-filled oasis has high 10 3" beamed ceilings, rich walnut hardwood flooring, oversized eastern and southern exposures, and high-end finishes throughout. The living room has an efficient layout with ample space for a sitting and TV area with a built-in surround sound music speaker system and a proper dining area. 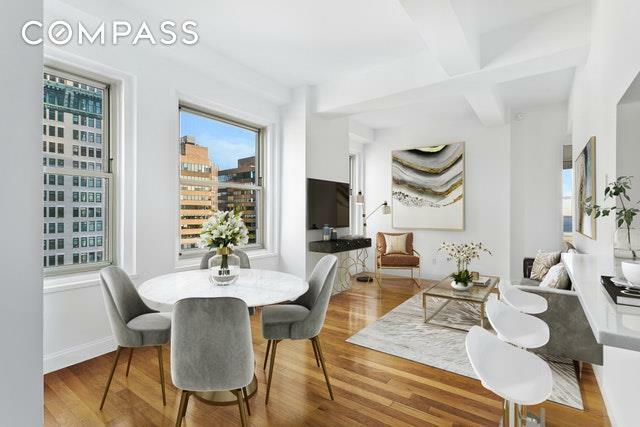 The three eastern oversized exposures flood the apartment throughout the day with natural light and showcase a spectacular city-scape combining new and old New York architecture that makes the Financial District's skyline so interesting. A passthrough to the kitchen allows for an additional dining option at the breakfast bar and highlights the gorgeous kitchen design. The stunning kitchen features premier state-of-the-art finishes including white quartz countertops, ample custom walnut cabinetry with a 6-bottle wine rack, and top of the line appliances, including an oversized Subzero refrigerator with bottom freezer drawer, Viking gas range and microwave, and two Fisher & Paykel dishwasher drawers. The queen-sized bedroom is well-positioned at the back of the apartment with impressive views of both the city and the Hudson River. The adjacent well-appointed bathroom rounds out this exceptional home with a Kohler deep soaking tub including an overhead rain shower, Basalto di Pompei lava stone floor, and silk marble tile from floor to ceiling.88 Greenwich AKA "The Greenwich Club" is a chic full-service condominium combining a timeless Art Deco design with luxurious services and amenities, including a full-time doorman and staff, landscaped 24th floor roof deck and lounge, billiard's room, state of the art gym, concierge services, cold storage, bike storage, central A/C and heat, and laundry on every floor. 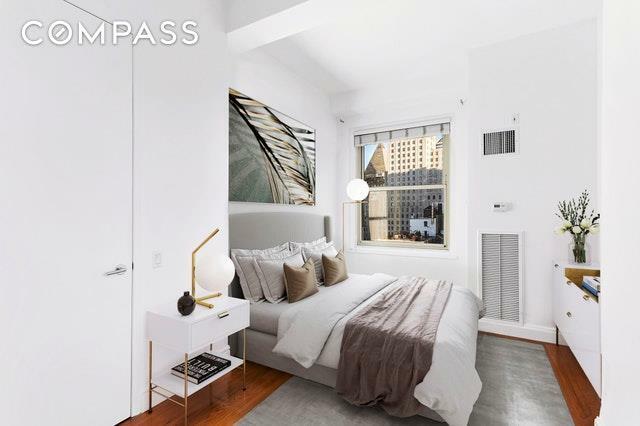 This prime FiDi location is surrounded by the World Trade Center and memorials, South Street Seaport, Wall Street, and Westfield WTC mall with trendy restaurants such as Capital Grill, Financier Patisser, Bobby Van's, Blue Ribbon Sushi, Le District, Eatly, Whole Foods, Variety Marke, and more! This convenient location makes it easy to travel uptown as well with access to many subways lines including the 1,2,3,4,5,A,C,R,W,J,M & Z. 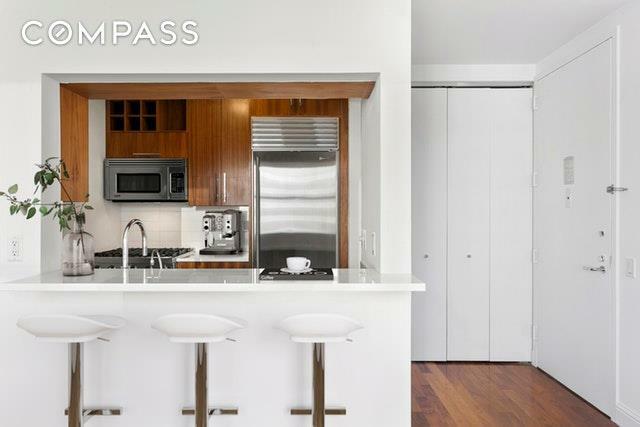 Listing courtesy of Kristin Thomas of Compass.